Be the first to share your favorite memory, photo or story of Cleva. This memorial page is dedicated for family, friends and future generations to celebrate the life of their loved one. 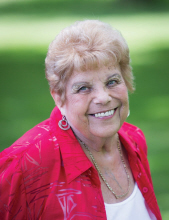 Cleva Dean Rodeffer, 81, of Bridgewater, passed away at Monday, November 26, 2018 at Life Care Center in New Market. She was born in Sasakwa, OK on September 20, 1937, a daughter of the late Arthur and Rachel (Drafton) Prince. Cleva was a realtor at ERA Kline & May Realty and was a tax preparer. On January 5, 1957, she was united in marriage to Carl Linwood Rodeffer, of Bridgewater. In addition to her husband, Cleva is survived by son, Darrell J. Rodeffer and wife Candy, of Bridgewater; daughter, Lori D. Rodeffer, of Houston; grandsons Evan W. Rodeffer and wife Virginia, and Jay G. Rodeffer; granddaughters, Kelli R. Putman and husband Joshua, and Harlow Rodeffer; great grandchildren, Logan Putman, Leah Putman, Layla Putman, Catherine Rodeffer, and Dean Rodeffer. She was preceded in death by siblings, Naomi Cherry, Ellen Prince, Frank Prince, Paul Prince, Kye Prince, Elaine Amarel, Wendell Gash, Victoria Gash, and Bobby Gash. A funeral service will be held at 11:00 AM on Saturday, December 1, 2018 at Johnson Funeral Service in Bridgewater with Pastor LaDawn Knicely and Pastor Janet Elsea officiating. Burial will follow at Oaklawn Cemetery. The family will receive friends on Friday, November 30, 2018 from 5:00 to 7:00 PM at the funeral home. To send flowers or a remembrance gift to the family of Cleva Dean Rodeffer, please visit our Tribute Store. "Email Address" would like to share the life celebration of Cleva Dean Rodeffer. Click on the "link" to go to share a favorite memory or leave a condolence message for the family.